We are excited to enter our 3rd season as the Cangelosi Sparks! 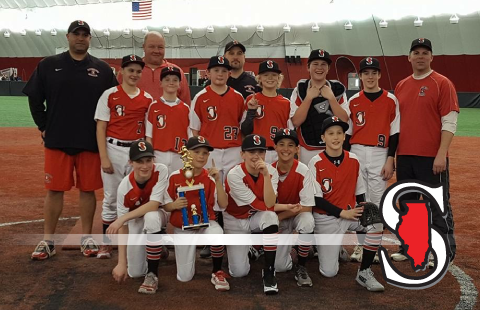 Since the merger of Cangelosi Baseball and the Illinois Sparks in June 2016, we have made several adjustments to our youth division which has led to accelerated player and team development. Our team’s are provided with indoor and outdoor field space multiple times per week throughout the year, as well as priority and discounted access to Cangelosi Baseball instructors. Our players also have unlimited individual facility access by being granted our Elite Membership. The goal of our youth organization is personal growth. Players develop at different times in their lives and it’s important that that we foster that development. The Sparks experience is unique because of our ability to expose players to the highest caliber of teaching. Your experience within the dome will give you the same opportunities that college and professional baseball players have. The combination of professional baseball, college coaching and Major League experience gives our staff the unique ability to guide each player into the best paths of development. Our mission is to prepare every player to thrive at the high school level. However, our missions doesn’t end there. As players show the potential to play beyond high school, our experience can provide them with the plan and the access to do so.